Site Diary Report displays all your submitted site diary forms. It also allows you to view and make changes on site diary submission(s). a. From your projects dashboard, click Reports button. b. 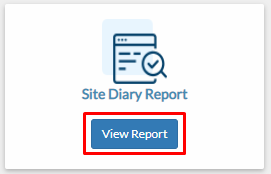 Locate the Site Diary Report tile then click View Report. Note: All your submitted site diary from all your projects will be displayed here. You may use the filters to filter out the displayed data. a. 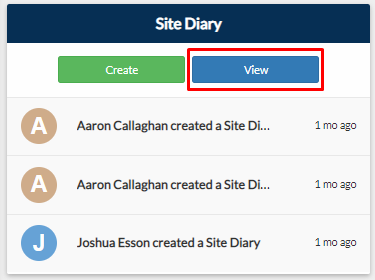 From the dashboard on your project page, click View on Site Diary tile. Note: Displayed submissions are filtered out by the current project you are in. a. From your navigation bar, go to Management > Reports > Site Diary Report.